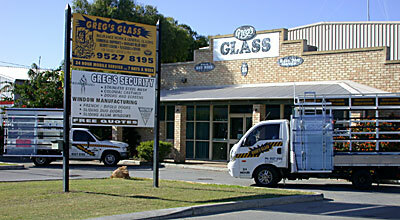 Greg’s Glass has been operating for twenty years servicing the Rockingham / Kwinana and Mandurah area and currently with a staff of fifteen. We operate five vehicles all equipped with mobile phones, tracking systems and manned by qualified tradesman, all with Federal Police Clearance and Security Licenses. Greg’s Glass is a local company owned and operated by Greg & Wendy James with Greg having over 32 years experience in the glazing industry. With this experience we guarantee our total commitment to our clients. We operate out of our own well-equipped factory in Crompton Road Rockingham. We are members of the Glass Merchants Association and adhere to their Code of Ethics and are Licensed Security Agents, which enables us to manufacture and install Security Screens and Doors. We also specialize in manufacturing our own Shower Screens, Commercial Shop Fronts and Aluminium doors and windows. For the past several years we have been a regular supplier of the Kwinana Hub Shopping Centre and City of Rockingham for their emergency glazing repairs. We have spent several years subcontracting for Western Property and Infraserv and have no difficulty meeting their standards of Quality Assurance. Greg’s Glass complies with all the Quality Assurance Aspects of the Glass Merchants Association and the Australian Standard for glazing 1288.